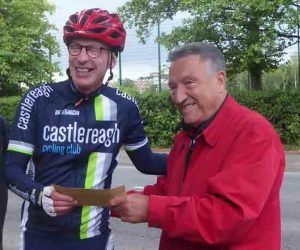 Windy conditions and tired legs from Sunday’s Gran Fondo may have deterred some from taking part in the longest club time trial of the year this evening – the Portaferry and Back for the Magreechan Cup. 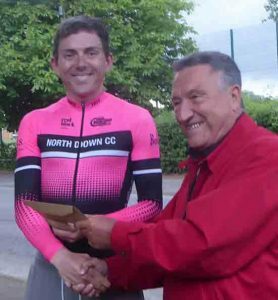 As it turned out the wind eased slightly for the return leg, and Keith Philip’s (North Down) winning time of 1:21:51 was just 16 seconds slower than his winning time last year. 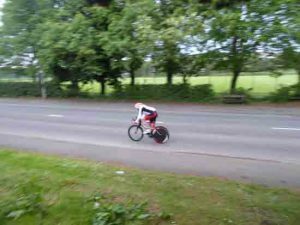 The photographer had to climb a tree to get this aerial shot of Niall approaching the finish. 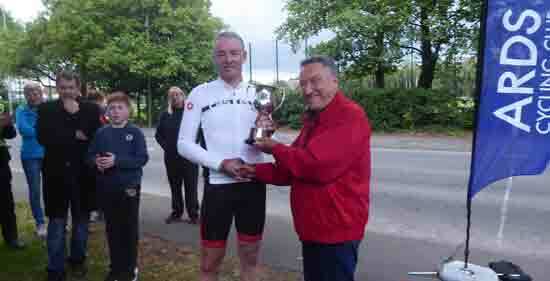 The battle of the Ards riders for the Magreechan Cup was another tussle between Niall Brown and Willy Gill. Observers estimated that Niall had gained about a minute by the turn, but Willy was starting to claw that back on the return leg. 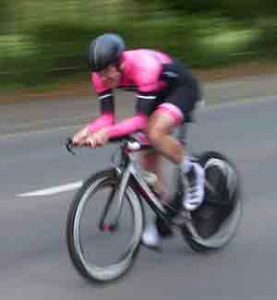 Unfortunately he punctured at the boat club, and Niall was able to “cruise” to the win in 1:30:46. Only other finisher was visitor Brian Wylie in 1:38:25. Thanks as always to the marshals and timekeepers – it’s a long evening for them! And thanks to club president Bobby Magreechan who presented this Cup to the club in 1986, and has sponsored the event ever since.